GIS helps cut through computational complexity and difficult visualization for better decision making. NRL can integrate its existing legacy software with advanced solutions. Today, there is much concern about human impacts on the environment. Often, however, it's vital to focus on the environment's impact on humans and their activities. When considering the environment's impact, mission planning for underwater vehicles is a complex process. To make realistic predictions of a mission's achievability, one must take into account such factors as bathymetry, currents, water density, waves, boat traffic, and geopolitical boundaries. Distilling this information into a visual process where an operator can rapidly make decisions is a daunting task. The goal of the research described in this article is to make this a simpler, yet more informed, process. 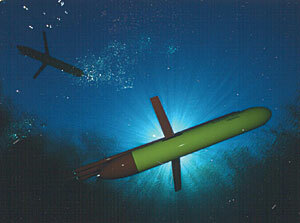 Two views of the Slocum Glider autonomous underwater vehicle. The U.S. Naval Research Laboratory (NRL) at Stennis Space Center, Mississippi, has developed a mission planning and monitoring system prototype that incorporates the impact of the ocean environment on mission performance for underwater vehicles. As with aircraft missions, consideration of the environment is paramount for underwater vehicles, and a flexible, common, standards-based software system is needed. 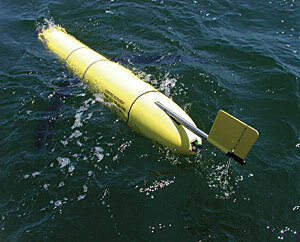 One type of underwater vehicle that is managed by this system is called a glider, a type of autonomous underwater vehicle (AUV) that is particularly susceptible to environmental conditions. This vessel does not have any propeller or mechanical propulsion system. Rather, it has a bladder, and the filling and emptying of this bladder allows the vehicle to ascend and descend in the water; wings attached to the glider body generate forward motion as the buoyancy is altered. This allows the gliders to expend little energy, and thus the missions they carry out can be extended for months over large expanses of the ocean. However, this mode of propulsion realizes speeds of less than a knot, which is less than the ocean current in many areas of interest. The state of the art in underwater mission planning is typically custom-made, vehicle- specific software systems that marginally incorporate environmental conditions. These packages are based on different languages and toolsets and typically comply with few, if any, existing standards. For the organization purchasing these systems, this results in independent mission planning and monitoring software for each different type of vehicle and the high life cycle costs that are typically associated with custom software. Economically, it makes sense to move toward a standard command-and- control system. NRL examined current systems and concluded that mission planning and monitoring are fundamentally exercises in geospatial/temporal decision making. Consequently, the supporting software should be built on a GIS foundation, as opposed to the existing practice of adding ad hoc GIS capabilities to existing custom-made and vehicle-specific command-and-control systems. 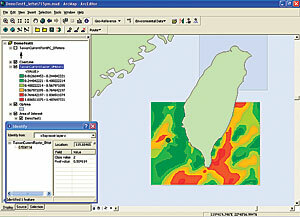 The Commercial Joint Mapping Toolkit (CJMTK), provided by the National Geospatial-Intelligence Agency (NGA), is the U.S. Department of Defense's standard GIS and thus a natural choice for the development of a common mission planning and monitoring system; the foundation of CJMTK is the ArcGIS Engine framework. By having a system built around CJMTK, NRL's customers will enjoy significant cost savings for life cycle maintenance. NRL is realizing significant development savings due to the extensive functionality already provided, including data ingest and management; coordinate conversions and projections; common symbology; standardized geographic user interfaces (GUI); and multilayer operations, control, and visualization. Because mission planning and monitoring are fundamentally exercises in geospatial/temporal decision making, the supporting software is built upon a GIS foundation. Top: The numeric value of the current magnitude (loaded as a layer) is under the green dot. 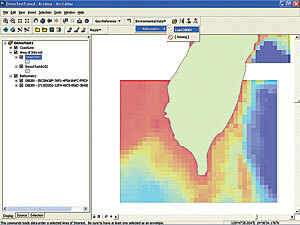 Bottom: Loading bathymetry. Most of NRL's development has been in the .NET environment using the C# language to interact with the ArcGIS Engine object framework, creating custom solutions. This is being done by making use of the geodatabase, ArcGIS Spatial Analyst, ModelBuilder, and geoprocessing tools to create, store, and perform analysis and comparisons on both raster and feature datasets. As mentioned, the task of underwater mission planning is complicated. During a mission, one is dealing with navigating a vessel in a three-dimensional volume and factoring in time-variable conditions, such as current, vehicle energy state, and ocean-sampling goals. Consequently, the decision space is represented by a three-dimensional volume over time (thus 4D), with N constraints: a 4D x N decision problem. All of this creates significant computational complexity and a very difficult visualization process for decision making. Because NRL is trying to facilitate rapid decision making, it is not necessarily interested in displaying every parameter to the decision maker. For example, salinity and pressure to establish water density, current intensity, and current direction are used to determine what areas are navigable for the vessel. NRL, however, only wants to display the impact this data has on a proposed mission, so it has devised a method using a familiar icon, which it calls Traffic Light Analysis (TLA), for this process. With TLA, NRL takes all the data it has and, using user-specified constraints on that data, computes what volumes in the 4D mission area are within those constraints (i.e., navigable for the vessel). Rather than displaying multicolored, multidimensional, time-variant figures to the user, the system simply displays a two- or three-dimensional volume. This volume is divided into "go" and "no go" sectors. Further, by compressing the time variable, NRL is able to significantly flatten the decision space and reduce the data size by a factor of 1,000. With the resulting TLA, if a decision maker can visualize a clear path area through the mission space volume, then a path can be constructed for the vessel with a reasonable expectation of mission success. However, if there is no way to get from point A to point B in this collapsed volume, NRL must factor time into the planning equation. This results in a slightly more complicated visualization problem for the operator, as some volumes may be navigable at certain points in time and nonnavigable at others. Still, NRL has reduced the original decision space to a much more manageable one that can be easily understood by the mission planner. Historically, most of the software written to perform these planning functions was written in C for the UNIX operating system. By using the ArcGIS Engine object framework, NRL has been able to integrate the existing legacy software as a temporary solution while it develops more advanced, native solutions. In addition, NRL can also use fuzzy logic to allow it to represent areas of uncertainty. Obviously, some constraints are "hard" constraints, such as the ocean floor and land masses. Currents, either in an awkward direction or at a high velocity, are often considered softer constraints, and fuzzy logic can help NRL represent this. NRL's initial work has shown that its staff's intuition was correct: building this mission planner on top of CJMTK has allowed NRL to not only share information with colleagues more easily but also create a more intuitive mission planner. For more information, contact Brian Bourgeois, NRL project manager (e-mail: bsb2@nrlssc.navy.mil); Donald Brandon, NRL scientist (e-mail: dbrandon@nrlssc.navy.mil); Ashley Morris, DePaul University and NRL scientist (e-mail: amorris@cti.depaul.edu); or Marvin Roe, computer scientist (e-mail: mroe@nrlssc.navy.mil).